Aziz Ansari, how do I love thee? Let me count the ways: One, he's painfully, stomach-clutchingly funny, whether he's starring in Parks and Recreation, Bob's Burgers, or Master of None. Two, he calls out the entertainment industry on the underrepresentation (or clichéd representation) of minorities. And three, Aziz Ansari's response to Donald Trump in the New York Times is everything I want and need right now, as well as further evidence that he's a fully-evolved super human who's using his celebrity for both A Good Cause and a important *slapping America gently on the cheeks* "wake the hell up, America" way. In our culture, when people think “Muslim,” the picture in their heads is not usually of the Nobel Peace Prize winner Malala Yousafzai, Kareem Abdul-Jabbar or the kid who left the boy band One Direction. It’s of a scary terrorist character from “Homeland” or some monster from the news. He then proceeds to dissect Trump's hate speech against Muslims and other non-white communities line-by-line. And, as much as I'm a fan of a well-thought out argument, I think Ansari's significance to liberal politics isn't necessarily his smarts (which are plentiful), but his ability to appeal his audience on a personal level. Ansari is important because his reach as an entertainment personality is so broad — presumably, he appeals to people across the political spectrum. And this is why I'd argue that Ansari's real superpower isn't as a comedian (though, sure, why not, that too — he's hilarious) but in using his personal experiences to make salient political points, whether via a New York Times thinkpiece or his stand-up. We've seen Ansari use his personal life for political ends before. For instance, with the casting of his Netflix show, Master of None, in which his actual parents played his parents. He told the Los Angeles Times in November 2015 that this casting was significant for him: "But [my] characters are really important to me because every time I see Indian parents portrayed on film or TV they're not three-dimensional, they're excuses for hacky ethnic jokes ... I wanted the parents to feel real." And they did! The show captured Dev's complicated, but always warm, relationship with his parents in ways that made the viewer laugh but also face serious topics like the difference between life as a first-generation and second-generation immigrant. 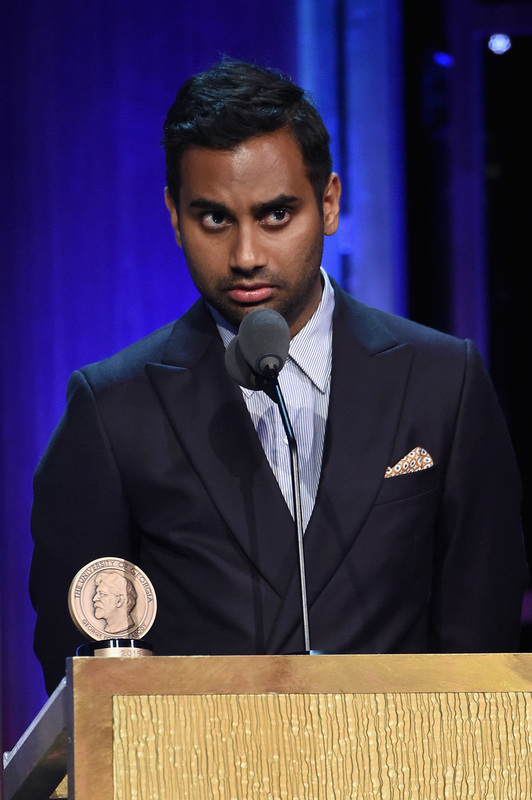 So let's take a moment today to thank whatever divine power or lack thereof you acknowledge for Aziz Ansari — in a political climate that's increasingly influenced by hate and fear, Ansari keeps us laughing and thinking — and what's more vital than that?